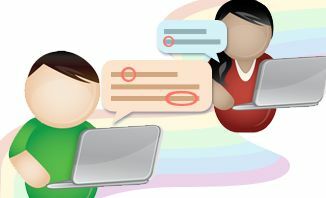 During a discussion under a comment, if you need someone to do further investigation or answer a question, you can assign the item to any of the editors of the presentation. You can use the symbol @ to direct the response to any editor. The assignees can see the comments or responses that are directed at them in the Comments panel. The program director, Tina, will give a presentation to the whole project team about 2011,2012 business plan. She drafted a presentation and she needs comments from managers in her project. Before, Tina had to send email to all the managers and asked them to give comments through mail or to update the attached presentation. When they did not give comments on the same version, Tina had to figure out which comments applied to which section and merge the comments together. If Tina wanted any of them to investigate an issue, she also had to send email. Now Tina shares this plan presentation with all managers and asks them to give comments. Managers can give comments at different times and discuss key issues. Tina can assign a question to any manager to have them further investigate an issue, and then the assigned manager can make changes to the plan.